The debut album from A Tribe Called Quest! Reviews for this album were positive, however, the act of being different almost hurt them in the eyes of some critics. Saying that it wasn't ''dancey'' enough or that it wasn't ''angry'' enough to be rap. What actually comes to mind is the fact that the group was formed in 1988, and this album was recorded in 1989 but released mid-year in 1990. It was as if, in an instant, the entire rap and hip hop genre had changed dramatically with the arrival of a new decade. Suddenly, songs like 'Can I Kick it?' (which was indeed a successful single) and the so-called happy-go-lucky bohemian hippies of rap, were no longer as significant as the newer styles that were already starting to take shape around this time. 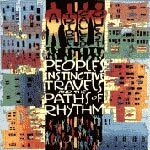 Peoples Instictive Travels and the Paths of Rhythm did earn them a lot of respect and helped them gain a large following for their positive messages and socially-conscious lyrics. The rest, as they say...is history.